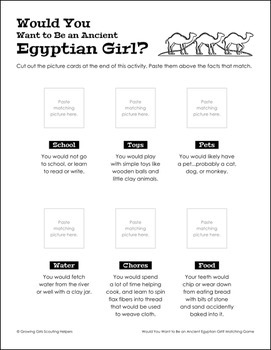 Juniors learn what life would be like as an ancient Egyptian girl with this picture-to-fact card matching game. This printable paper activity pack is designed to fulfill Junior Playing the Past badge - Step 1 with minimal supplies, ink and time. 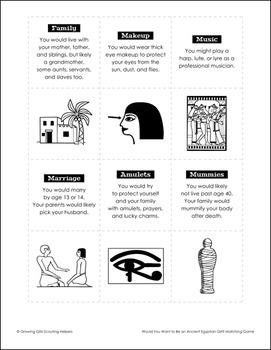 "Would You Want to Be an Ancient Egyptian Girl? 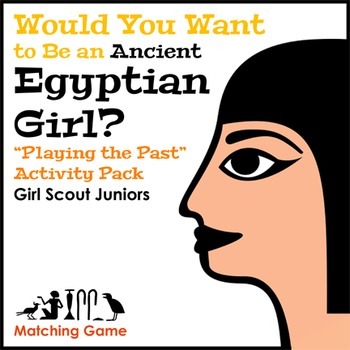 Matching Game" is meant to be played in groups of two and requires little-to-no adult support. 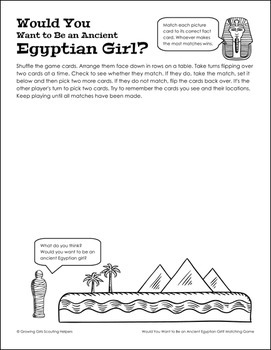 While a girl may play this game by herself, a set of cut-and-paste worksheets covering the same material is provided as an alternate/badge make-up activity. Remember to "use resources wisely" by leaving feedback for this product to receive TPT credits good toward a discount on future Growing Girls product purchases. Looking for more fun printables for your troop? Living "Fair" All-In-One Booklet - Girl Scouts My Promise, My Faith - All Steps!